Holds up to a 20" monitor. 6-outlet mini surge protector with power switch. 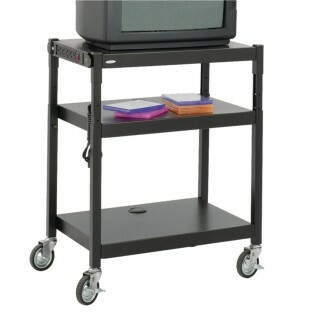 Adjustable cart features three 24" x 18" shelves. This heavy-duty, all steel cart is ideal for media equipment. Holds up to a 20" monitor and features a 6-outlet, UL®-approved, mini surge protector with power switch. Three 24" x 18" shelves. Cart is adjustable in 2" increments from 28" to 36" high. Mobile on 4 swivel casters (2 locking). Ready to assemble.